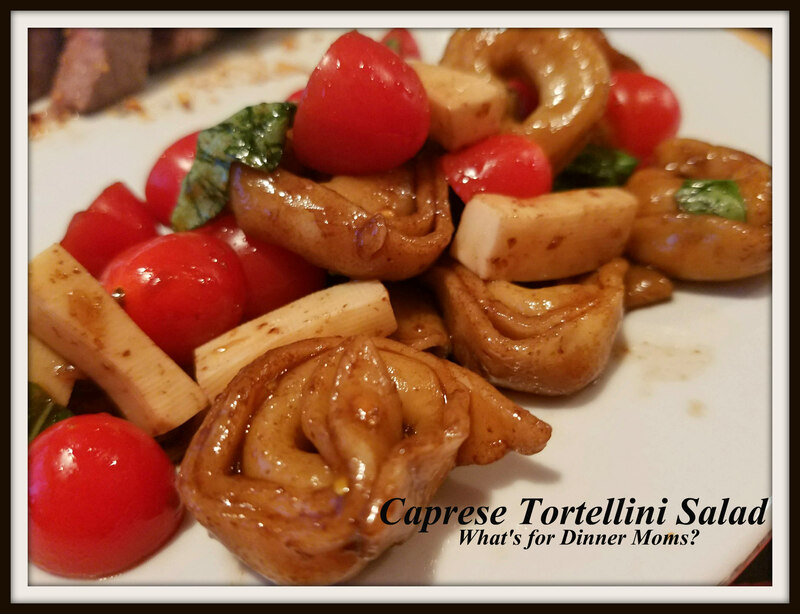 Caprese Tortellini Salad – What's for Dinner Moms? A moment of mommy bragging. It seems that the 2 1/2 hour drive to take my son to Latin classes has paid off. 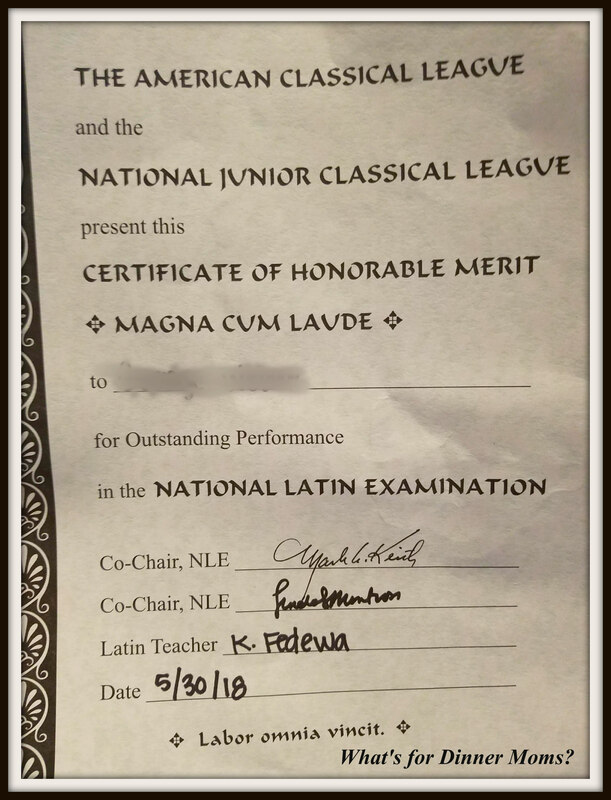 He received an award for taking the National Latin exam. He finished in the top 1/3 of all people who take the test. He was worried because he thought he did not do well on the test. I guess he did better than he thought! We stopped to pick up some fresh basil at the grocery store but they were out of the little packets of leaves they usually have so we bought a whole plant. It was the same price as the little packets but we put it in our window and have had fresh basil for the past couple weeks. It is nice to just pick a few leaves off to add to a grilled cheese sandwich or a salad. I wanted to use a bit more of it so I decided to make a Caprese Pasta Salad. 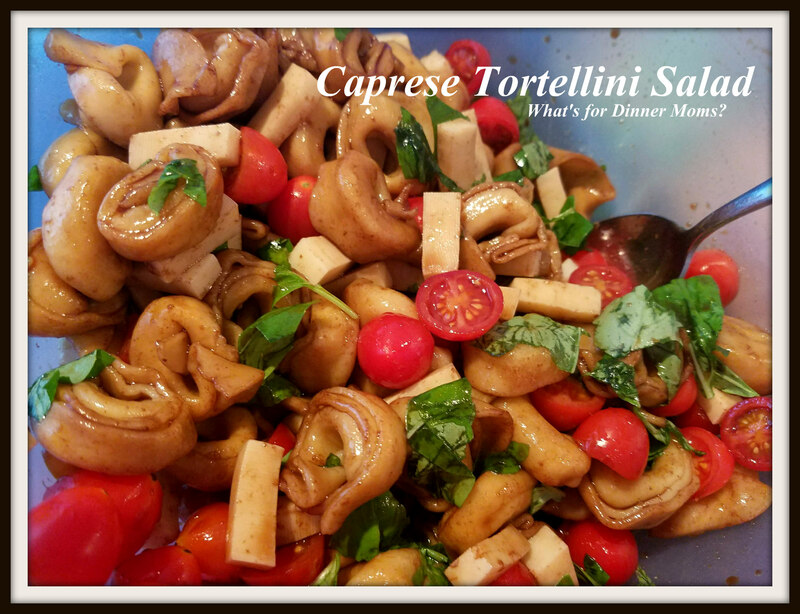 We love the flavors of balsamic and basil so I knew this would be a hit. This was a hit! Everyone wanted the leftovers for lunch the next day. My daughter was taking the bit of extra dressing at the bottom of the dish and drizzling over the salad. She loved the vinegar taste. tip: If you are using a lesser quality balsamic vinegar add a teaspoon or two of sugar to the vinegar while you are reducing it to cut the tartness. I served this as a side salad with our steak but you could easily serve this as a main dish in large portions. Boil tortellini according to package directions. Once it has cooked through drain and rinse the tortellini in cold water. Dry tortellini slightly with a paper towel. While tortellini is cooking in a small saucepan over medium heat bring balsamic vinegar (and sugar if using) to a slow simmer while stirring constantly. Allow the vinegar to reduce by about 1/2. Add tomatoes, onion (if using), olive oil, and Mozzarella cheese to tortellini. Stir well. Add balsamic reduction and stir well. Add torn basil and stir well. Taste and adjust spices and olive oil as necessary. Next Post How Often Do You Eat Out? Sounds good, think I’ll make it tonight! Thank you! It was so simple. Hope you like it! Thank you! Latin has definitely grown on him. He knows it will help him in the future. It is a great lunch salad! Congratulations to your son, Marci and the salad looks delicious, I can smell the basil.. Thank you! Love, love, love basil! This salad sounds delicious, Marci. Congratulations to your son, Latin is not easy at all. Thank you! He loves taking Latin and will be taking Latin 3 and 4 next year. Congrats to him! Also, this looks good and perfect for summer. I made this tonight, it was delicious! Yeah! I am so glad you liked it!